No, that wasn't a headline I'd ever expect to write. But it seems to be what is happening right now over in the US. It seems to be happening here in the UK too - I haven't spotted any media reports about a doctor being tried for multiple counts of murder, though Father Ed Tomlinson did say that the Daily Mail had given it a brief mention. 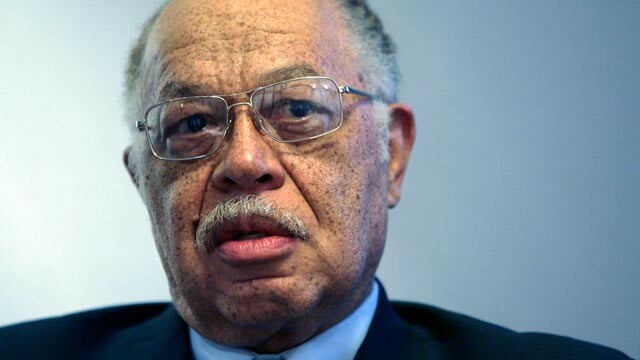 Kermit Gosnell is on trial for the murder of seven newborn babies and one woman patient. There are several other charges which were recommended, almost too many to mention. I can't bring myself to read the stuff in detail - I keep having to switch away from the horror of it. It seems that there would have been many other cases of murder, only clinic records have been destroyed. The only reason I know about this case is that a few people have been so outraged over the lack of media coverage that they have posted information on Twitter and Facebook, and from there it is now hitting the blogosphere. I have to add a warning here. Unless you have a strong stomach, don't click on the links that follow - some of the images are so horrible that I would rather I hadn't seen them myself (and I've cut up all sorts of stuff in my time as a scientist.) I would not actually include the links if I didn't think it was vital that this story is given as much publicity as possible before the mainstream media and politicians try to bury it. 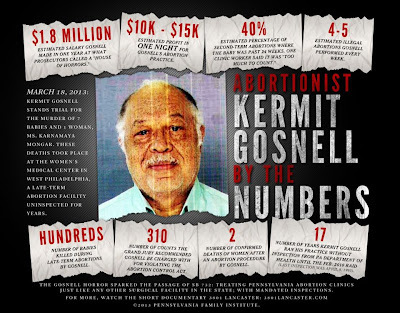 There already seem to be moves towards removing the Wikipedia entry on Kermit Gosnell. You can take stuff off the internet, but the evidence is there to find if people dig deep enough, and the more links there are, the harder it is to bury. When Dr. Gosnell's clinic was raided after the death of a woman patient, the police found a macabre scene: severed baby feet of various sizes kept in see-through containers and bodies of babies in a freezer and in the basement. The upper spinal cords of some of the babies had been severed. Keeping the feet, almost as trophies, seems particularly perverted! Although he is also accused of carrying out illegal abortions (24 weeks is the limit in Philedelphia) Dr. Gosnell carried out most late-term abortions legally. That isn't what he is being tried for. Allowing babies to be partially born and then killing them by sticking a needle into the brain before the baby is fully delivered is a perfectly acceptable procedure - legally. The main reason that Kermit Gosnell fell foul of the law is the technicality that the babies were actually delivered alive and then killed. The method of killing, and what he was killing are the same in the legal and illegal cases. It's all about timing. And therein lies the reason for the media silence. The case provides incontrovertible evidence that what we dreadful pro-lifers have said all along is true. Abortion is not simply the removal of a clump of cells or a blob of tissue. Abortion is the killing of a baby. I've been feeling rather under the weather this past week. 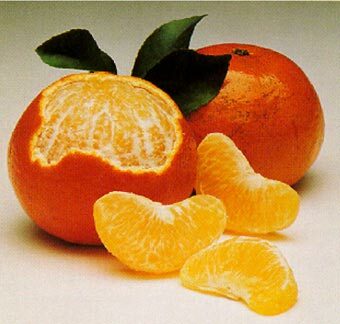 I even found myself craving tangerines, though I'm regretting having succumbed to the temptation, as they're awkward to peel and I keep finding bits of tangerine peel everywhere, as well as having squirted juice in my eye on more than one occasion. Anyway, I have been singularly devoid of blogging inspiration all week. I've concluded that I need to do a bit of blog spring-cleaning as a way to get the creative impulses firing. The blogrolls are way, way too long to be useful, and I suspect that several of the links are dead. They need some serious pruning,and I may change to the snippet-based rolls which change according to the most recent posts. 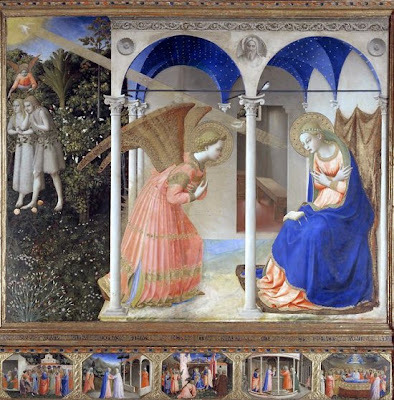 Today is the transferred Solemnity of the Annunciation. Happy Feast Day! I teach that faith before the 1960s was dia-bo-lic. With errors in translation that were really quite spectacular. It's really just of interest to a dusty old historian! Instead, we sing "Shine, Jesus Shine" and Inwood's new cacophony! Vox in Rama posted a picture of a book she's just finished reading on Facebook. As her book addiction is far more serious than mine, I was rather amused to note that it was a book I had bought and read several years ago. 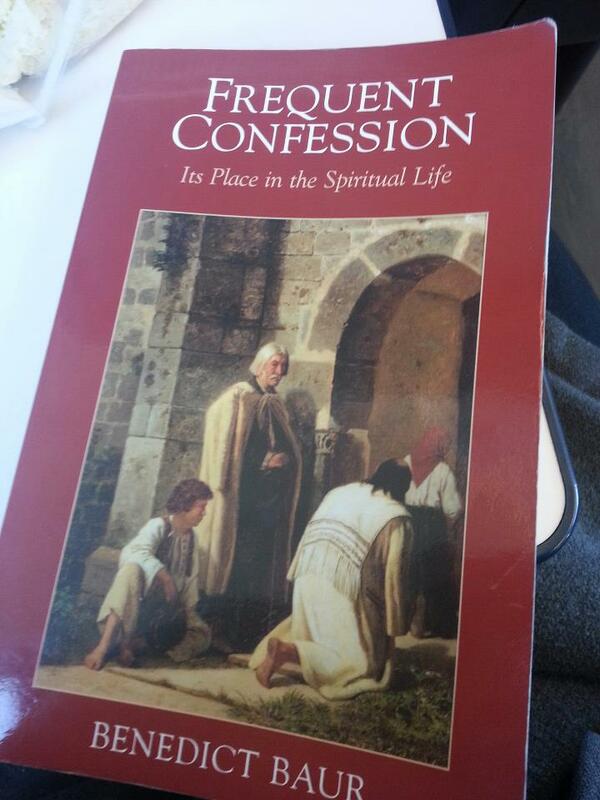 It really is an excellent book - not least because it explains so clearly why going regularly to Confession to confess venial sins is such a help in the spiritual life. As someone who has been discouraged in the past by the attitudes of some priests (and Bishops), it is great to hear the practice given a positive press. "What we have in mind is the frequent and regular Confession of a person who in general does not commit mortal sin but rather lives a life of union with God and is bound to him by love. Such a person may, nevertheless, be guilty of many disloyalties and failings. He may have various weaknesses and bad habits and perverse inclinations, and he may have to struggle hard with his inordinate desires and his self-love. It is not a matter of indifference to him that here and there he has acted against his conscience, even though it be in nonessential matters." Do go and read Vox in Rama's review in full too. I'm an impulse blogger. If I think too much about the construction of a post, it goes horribly wrong, and I have to ditch it. Against my better judgement, I stopped to think about a couple of posts last week... and have decided to consign them to the bin. I never quite understood the allure of a musical which everyone said was so very sad. My idea of entertainment is something that will take me out of everyday humdrum activity and/or make me laugh. Even the name of the musical sounded like a bad omen... and then to hear that they'd made it into a musical film made me want to run screaming for the hills.